"div" elements are block elements. "div" elements can have PCDATA as contents. "div" elements can have inline elements as sub-elements. "div" elements can have block elements as sub-elements. A "div" element will be displayed as a paragraph by most browsers. Q: What is the number one advantage of using XHTML? 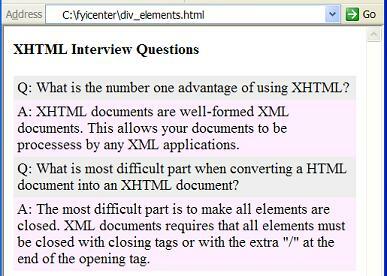 A: XHTML documents are well-formed XML documents. must be closed with closing tags or with the extra "/"